The package is a part of the confectionery. Create the prototype of the package in house, using CJV30-60 which performs satisfying print speed, cost, and quality of the results! Kobe Fugetsudo is a long established confectionery manufacturer founded in 1897. The flagship product, "Gaufre", which was released in 1927, has been enjoyed by the large numbers of people of all age groups. Now the company has stores across Japan. The perpetual quest for the product development by keeping the traditional products. From its tradition, Kobe Fugetsudo is populary known that many say "Gaufre always brings to mind Kobe Fugetudo". They keep the traditional tastes from at the time of founding, and use the same design for wrapping paper, can, and package. This leads to deliver "Promised taste" to the customer, and built the brand image of the confectionery. At the same time, they try to plan and develop the new sweets which pursue "New taste" and "Exclusive fascination" such as seasonal products for Valentine and Helloween, or collaborated products with clients. What is more, they make prototypes of packages including wrapping paper, box, display showcase, and POP for the presentation to the client. In case of planning the product which life cycle is about three month, the lead times become shorten. To gain the support from clients, how to meet their demands flexibly and smoothly was the key. Also, when giving a presentation, the realistic package was required. 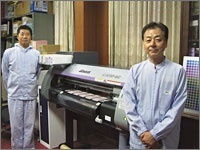 We used the thermal transfer desktop printer before introducing CJV30-60, but there was a problem with the finishing. Therfore, we sometimes had to outsource making prototype, in which the problems with speed and cost arise. The most important factor was the "Finishing". 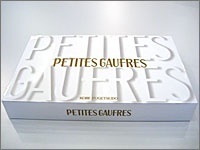 Not only the prototype of the package completes just by printing, but also the prototype should also be extended to make boxes by attaching the package on the cardboard. In addition, the prototype of the realistc metalic can should be made by attaching the printed clear media to the can. CJV30-60 performs its "Finishing" with a high quality which is close to the real one. Previously, when we outsourced a prototype, it took long time from ordering to reception, and that put us under the heavy time pressure. CVJ30-60, however, allows us to design the prototype to our satisfaction, which leads to plan new products in short time cycle. Also, we do not need to care about the odor of the solvent ink, because there is no constraint as regards the installation site with its compactness. The eight color configurations of CMYKLcLm+White+Silver ensures smoother gradation, and allows for putting the metalic design into shape.This rich color configuration expands the variations of the proposals to the clients. In the stage in which begins the mass production, communication on color matching became smooth by giving the data to the printing company. The long established confectionery manufacturer "Kobe Fugetsudo" has more than 100 years history from its foundation. The progressive and creative company keep their traditional taste, and also design the package themselves. They try to have the spirit of challenge with the belief of "The package is a part of the confectionery". We cannot take our eyes off their confectioneries pursuing "New taste" and "Exclusive fascination". 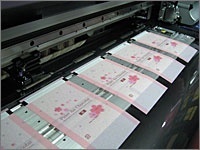 The prototypes used on the presentation printed by CJV30-60.